Retreat to one of our contemporary guest rooms to relax and recharge. Details include cozy duvet covers, an oversized work desk, and a 32" high definition flat-screen television. All Traditional and Deluxe rooms feature the Sheraton Signature Sleep Experience, custom-designed for a great night’s sleep with a plush-top mattress and four pillows. For a little added space, our Deluxe Rooms are extra large corner rooms with contemporary furnishings, pillowtop beds, large desks and two-line phones with data port. 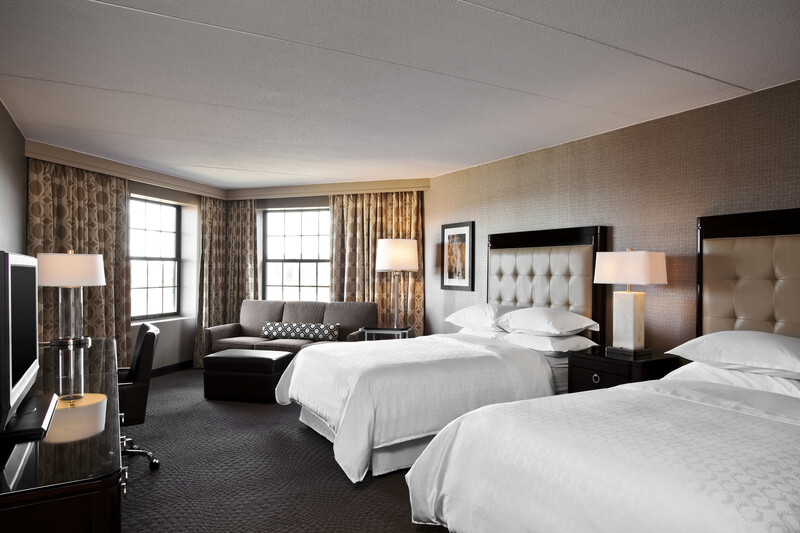 Guests at the Sheraton Parsippany Hotel will enjoy all the latest comforts and conveniences amidst our castle walls. Our rooms feature great amenities to make travelers feel right at home, from the Sheraton Signature Sleep Experience to a work desk, in-room movies, room service, and important details like the coffee and tea maker and ironing board. Be sure to take advantage of the High Speed Internet Access, available in all guest rooms, at charge. 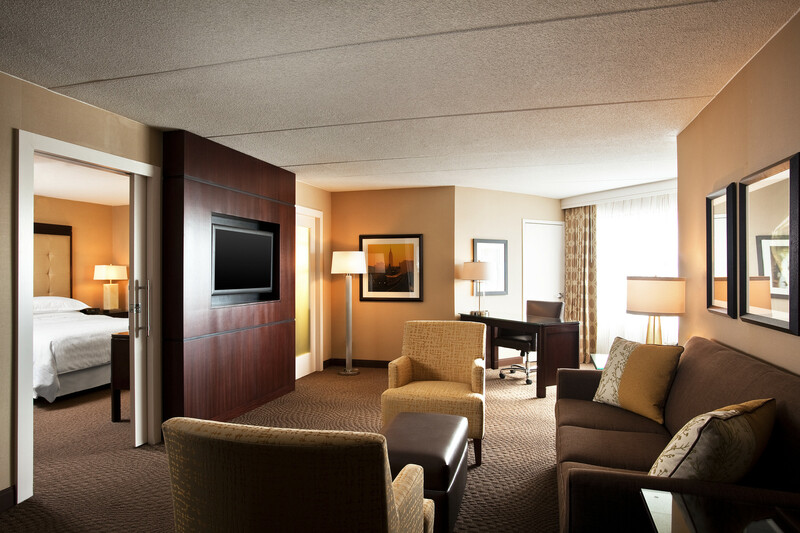 Enjoy the additional space and upgraded amenities of one of our luxurious Suites. Elegant artwork lines the living room’s walls, while upscale furnishings include a custom seat with an ottoman. Stay on top of work at the oversized desk that features an ergonomic chair and a cordless phone. The spacious separate bedroom houses a 37” flat screen television and the Sheraton Signature Sleep Experience, custom designed for a great night’s sleep with a pillow-top mattress, a cozy duvet, and four pillows. A large closet and a wall-mounted mirror add even more convenience to your stay. The full bathroom includes a make-up area as well as a body sponge, shaving cream, and bath gel. Accessible Suites are available and feature bathrooms designed for guests with disabilities. Two traditional rooms may be available to connect to a suite to form a three-bedroom suite. Please contact the hotel directly for additional information. Suite guests are welcome to spend quality time unwinding in our exclusive Sheraton Club Lounge, located near the rooms on the sixth floor. A relaxing, upscale space, the Club Lounge offers complimentary daily breakfast and afternoon hors d’oeuvres, and a variety of beverage options. Take advantage of the private Club Lounge where you can connect with friends, meet with your team, or simply relax by catching your favorite TV show. Need to get some work done? A copier/fax/printer and complimentary office supplies are available.